Chinese residents in Ottawa marked the Lunar New Year this past week, but celebrations will continue throughout the month as people indulge in special recipes and traditional dance. The Lunar New Year happened earlier this week, but celebrations are continuing throughout the month as people indulge in special recipes and traditional dance. The Year of the Pig arrived on Feb. 5, 2019, and it's believed to bring wealth and good fortune, said Jamie Liew, who, like many others, is celebrating the new year with her favourite dishes. 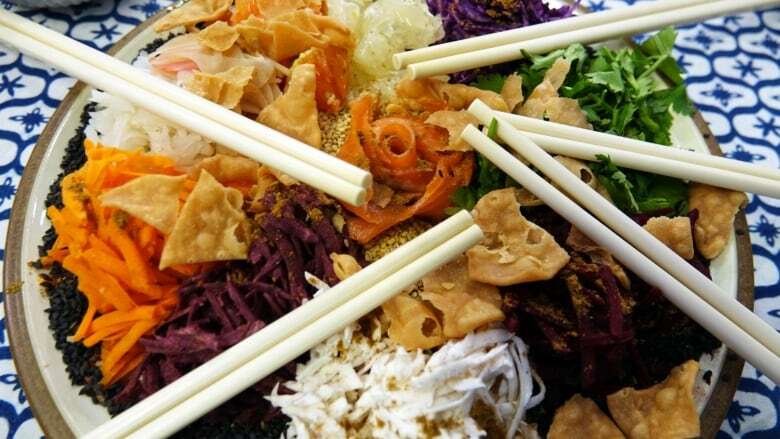 The Ottawa resident is sharing her recipe for a "messy" yee sang, also known as prosperity toss salad, with CBC Radio's All In A Day. "The messier [it is], the more luck [we'll have] and the more prosperous we will be this year," she said. "The idea is that you want to toss a salad high … the height is important because it's about bringing height and bringing abundance and lifting." The dish, which features a number of root vegetables and often raw fish, is made throughout Southeast Asia by Chinese families, she said. Can't see the gif of the salad being tossed live on air earlier this week? Watch it here. ½ packet wonton dumpling wrappers. 1 ½ lbs taro, peeled. Sufficient vegetable oil for deep frying (if you are frying the dumpling wrappers and taro). 1 small purple yam, peeled. 8 oz purple cabbage (or cucumber). ½ small pomelo, peeled and broken into small chunks. 1 blood orange (or other orange/grapefruit). ½ cup cilantro, stems removed. 10 to 12 slices pickled ginger, cut into strips. 1 tbsp toasted sesame seeds (black sesame seeds add colour). 1 packet smoked salmon/lox (about 3 oz). ½ lime or 1 tbsp lime juice. 1/3 cup apricot or plum jam. Cut wonton wrappers into strips. If you're deep frying the wrappers and taro, heat about 1 inch of vegetable oil in a fry pan, and deep fry the wrappers until golden brown, about 30 to 60 seconds. Remove with a metal strainer. Deep fry taro strips separately until crispy, about 2 to 3 minutes. Remove with metal strainer. Store in airtight containers until ready to be used. Shred daikon, purple yam, beets, purple cabbage and carrots into fine, long strips. Keep the other shredded vegetables separate. Do not mix. Place smoked salmon in a small bowl, and place the bowl in the middle of a large platter. Combine all dressing ingredients in a small pan over medium heat. Stir until sauces are well mixed and slightly thickened. Remove and place in a small gravy boat or small bowl. Arrange dumpling strips, taro, shredded vegetables, cilantro, pomelo and pickled ginger into individual sections on the large platter. When everyone is gathered around the table, our lime juice onto smoked salmon. Transfer the smoked salmon onto the vegetables. Sprinkle five-spice powder and sesame seeds, and drizzle the dressing over the vegetables. Get everyone to toss the salad using chopsticks. While tossing, yell "Huat Ah" — a phrase to wish oneself prosperity.